Just over a week ago my travel buddy and I were romping and gallivanting all up and through Ecuador and Peru! It was my first time to South America (one more continent down!) and the highlights of the trip were trekking through the Amazon and climbing Machu Picchu. The two-week itinerary was intense, including six flights, over 30 hours on buses and trains, nearly sinking in a tin boat, and miles and miles of walking (mostly uphill!) When we purchased the guided tour on Friendly Planet, little did we know that we’d be among the first group to ever take this tour–so we were the Guinea pigs and there were definitely a ton of kinks. But overall we had an amazing time! 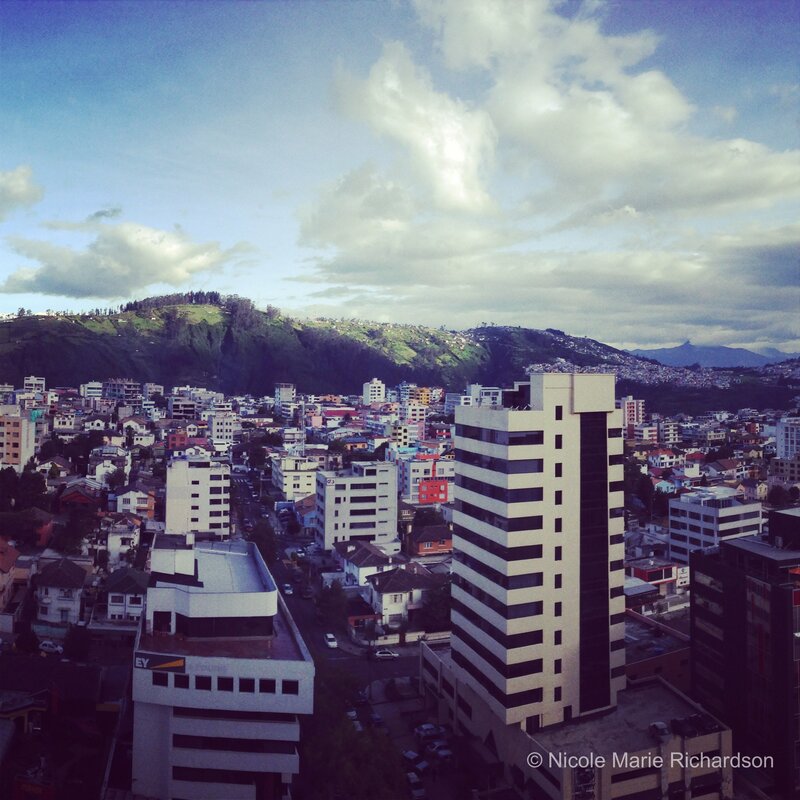 Our trip got started in Quito, the capital of Ecuador (which means Equator in Spanish–hence the title of this post). Quito is a very old, picturesque city surrounded by mountains and volcanoes, including the still-active Tungurahua volcano located 80 miles south (which decided to spew columns of ash just days after we left). This place has been around since the first millennium and it was occupied by native tribes, including the Quitu. Today Quito is mostly squat cement commercial buildings, lots of traffic and stunning graffiti art on every available surface. The Old Town is filled with colonial architecture dating back to the early 1500’s and has been declared a UNESCO World Heritage site. The majority of working-class people live in the Old Town in serviceable but basic homes. Women sell their fruits and other food on the streets, children in their school uniforms play on the sidewalks, and hard-working men with dusty clothes and weathered saddles carry construction materials here and there. This privately-owned museum supposedly marks the spot at which the Earth’s Equator passes through Ecuador. The Equator is an imaginary line equidistant from the North Pole and South Pole. Here I straddled the Equator with one foot in the Northern Hemisphere and one in the Southern Hemisphere. The guide demonstrated a series of tricks to verify that I was in fact at the Earth’s midpoint — 0 degrees latitude, 0 minutes, 0 seconds. She told us it was easier to balance an egg at the Equator (it wasn’t!) and that water in a sink would swirl in opposite directions on either side of the line (it did). She explained that it was harder to maintain our balance and instructed us to walk heel to toe on the painted line of the Equator with our eyes closed (I was successful at looking like a drunk fool). As the title of my blog post suggests, Quito has another attraction called Ciudad Mitad del Mundo or Middle of the World, a government-owned park that pays tribute to the Equator. It was once believed to be precisely at Earth’s midpoint, but it was later found to be nearly the length of two football yields off! (Opps!) The monument is beautiful nonetheless and the location will be the site for the Union of South American Nations (UNASUR) headquarters, which is currently under construction. At the summit of El Panecillo hill sits a 147-foot-tall aluminum monument of the Madonna. Built in 1976 the virgin stands on top of a globe and is stepping on a snake. The site is believed to originally house a temple where the indigenous Indians worshiped the sun, but like many of these sites, the Spanish replaced it with a Catholic symbol. The Madonna is huge and can be seen from many miles away and the panoramic view from Panecillo Hill is amazing. Driving through Quito is like visiting an open-air art gallery spread out over many, many miles. The walls along roads and on buildings are covered with the most beautiful graffiti. It’s definitely worth taking a ride around during the day just to take in all the painted scenes. This monastery located in Plaza de San Francisco is quite impressive, including three churches, 13 cloisters, and a massive courtyard. The 16th-century Roman Catholic complex has the distinction of being the largest architectural ensemble among the historical structures of colonial Latin America, according to Wikipedia. It took almost 150 years to build (1534-1680) and houses the city’s beloved sculpture Virgin of Quito (1734). Inside the Church of St. Francis complex is a cheerful restaurant and gift shop. The space is small with a great indoor/outdoor seating area and views of the square. The menu boasts many tradition Ecuadorian dishes and before or after your meal you can check out the tiny gift shop/museum in a cave-like structure underneath the church. It’s a cultural mecca displaying masks, sculptures, vases, and more. But one has to wonder if it’s sacrilegious to have so many fornicating statues sitting right under a church! Just a short walk from Plaza de San Francisco is the Jesuit Church of the Society of Jesus. This is Quito’s most famous church and it’s said to be the country’s most beautiful church. Why? Because the large central nave is decorated with gold leaf, gilded plaster and wood carvings. The church took nearly 160 years to complete starting in 1605 and ending in 1765. If Ecuador could melt down the gold in this one church alone the country would be rich! Just across the street is another church worth checking, but not nearly as impressive as La Compañía, called Iglesia de El Sagrario. You can’t walk in the historic center of the city without catching a glimpse of the massive Basilica del Voto Nacional or Basilica of the National Vow. The Roman Catholic church is the largest neo-Gothic basilica in the Americas. Construction started in 1892 and the building is noted for its grotesques in the form of native Ecuadorian animals such as armadillos, iguana, and Galapagos tortoises. During our foot tour of the center of the city, we got very lucky to catch a glimpse of the Ecuadorian president at an event inside the gates of the Carondelet Palace. The palace is the center of the Ecuadorian government and can be accessed with very little fanfare by the public (no wonder the place has been looted multiple times). The palace overlooks Independence Square or Plaza Grande, around which are also the Archbishop’s Palace, Municipal Palace, Hotel Plaza Grande, and Metropolitan Cathedral. After many pictures and taunts, I finally got one of the guards to smile for a picture! This trendy neighborhood runs down the winding road called Camino de Orellana, connecting the main road out of Quito to the suburbs. This street gives San Francisco’s Lombard Street a run for its money! The bohemian neighborhood is filled with many local artists and a couple of hippy cafés and bars. At the very top of Camino de Orellana there is a stunning viewpoint where you can get panoramic views of the suburbs outside Quito. At the bottom of the street is the Plaza de Guápulo Siglo XVII and Iglesia y Convento de Guápulo. Every year on September 7 the Guapuleños honor their neighborhood with the Fiestas de Guápulo, a celebration complete with costumes, parade, food, drink, song, dance, and fireworks.